Menacuddle well and the Druids Chair is located in a green area below the road to St Austell and the well house butts tightly against the twenty foot high wall. 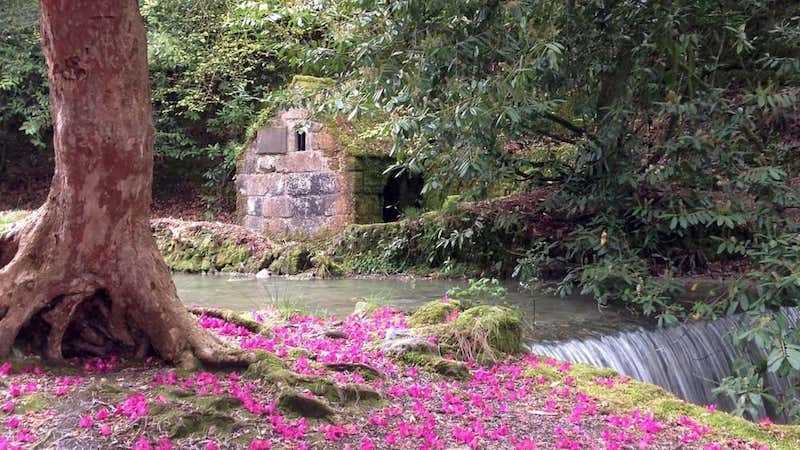 It is surrounded by trees and rhododendron bushes, beside a gentle stream and a waterfall. The small granite well house was originally built in the late 15th. century and restored by Sir Charles Graves Sawle in 1922. A Gothic archway leads into the peaceful sanctuary where the crystal clear water springs forth, in glaring contrast to the milky white, china clay tainted water flowing in the river beside it. In the Middle Ages there was an important chapel in the area adjoining this well house, although no trace of it now remains.